Twist in the Sky for a Happy Fourth of July! Ailsa’s travel-themed photo challenge today is Twist. Just in time for the Fourth of July! These were last year’s fireworks (more photos are here). We’ll see what tonight will bring! Here‘s another kind of Twist, in response to The Daily Post’s Photo Challenge, which also had Twist as its theme only a month ago. 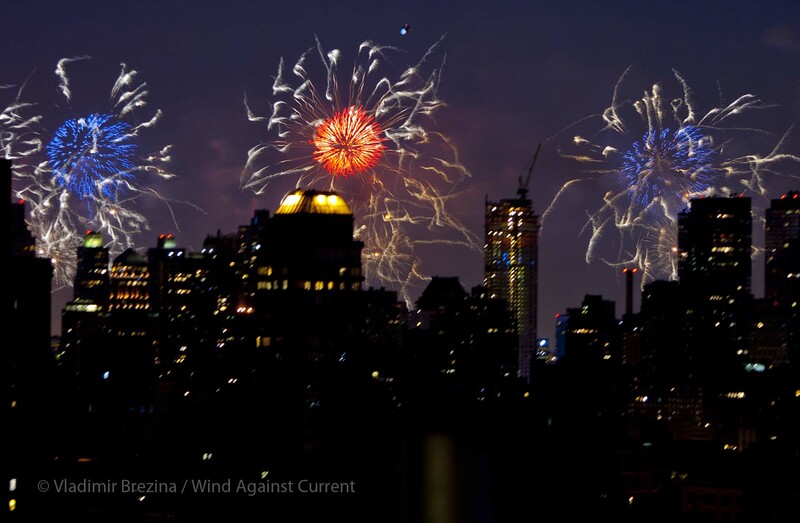 This entry was posted in New York City, Photography and tagged Fireworks, Fourth of July, New York City, Photography, postaweek, postaweek2014, Travel, Twist, Weekly Photo Challenge. Bookmark the permalink. A bipod–I love that. Great shots. Happy Fourth to you! Is this the view from your apartment? Great shot. From the roof of the building. The apartment doesn’t face in quite the right direction too see the fireworks where they were last year. you have a GREAT backdrop! probably what I meant…but, I’ve a tendecy to talk and write backwards sometimes!…ha, ha! Such a beautiful sot of the fireworks. Hope you had a good day celebrating. The jazziest fireworks so far —- until this years? Love the colors! Great captures!